My Outfit of the Day was inspired from Prada’s Spring 2011 collection. 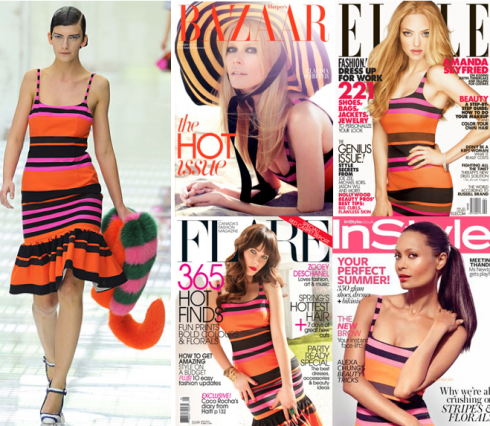 It is the striped colorful dress that was seen on over 48 magazine covers and countless red carpet events. I was first attracted to this dress for Prada’s use of a mixture of colors along with the stripes pattern. The Prada dress runs $1,150 but my dress that I’m wearing is actually from Asos and although it is now unavailable, here’s a similar version. I placed this particular dress on my wishlist for month’s before ordering it. I wanted to wait until it was reduced down from it’s original $62 price. Then in October it finally went down to $25 but by then the weather permitted me from wearing it, that is up until tonight. I finally know what Beyonce meant when she said, “Put on your freakum dress”. This dress, although some curvy women would shy away from stripes, gives you all kind of accents to your curves. I walked out the house with an extra boost of confidence and it was all about the dress. It is made of viscose and elastane with a touch of peplum at the bottom. I didn’t want to keep everything matchy-matchy by adding pink or orange shoes so I broke up the color scheme by adding teal colored shoes and clutch of that same color. 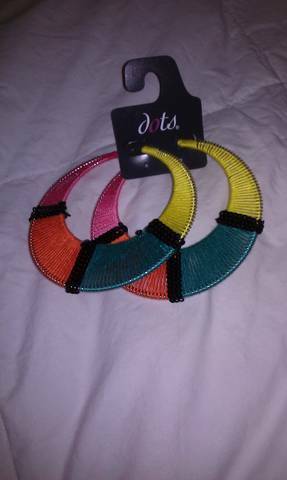 I got these earrings from Dot’s a few weeks ago and couldn’t think of what to wear them with until tonight. The final look all came together well. I love this dress and finally found a new one for sale online. I regularly wear a 16 US ASOS, but his one is a 20 US. Did you feel this dress ran true to size or was it tight? You look great! American Rag @Macy’s has a very similar version that I think you have convinced me to pick up! That dress looks SUPERB on you! That dress looks so hott on you chica!!! You look fantastic and I like the Teal idea and your jewellery. No need to spend a $1000+ to look it! I recently learned that horizontal stripes can work for curvy women, if they are wide and/or bold they can look really hot and figure flattering. You look fab! That dress fits your curves perfectly!